These three sweet seniors have never had the opportunity to exercise, stretch or play.... They have been confined in cages their entire lives. 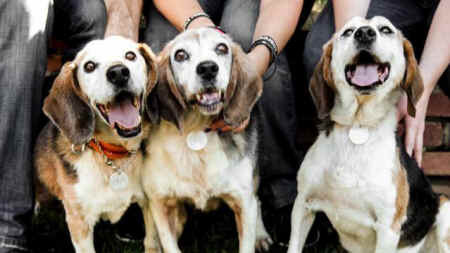 Meet Alvin, Simon and Theodore, beagles just shy of 14 years of age, raised and tested on in a horrific laboratory and then thrown away at an overcrowded, under-funded shelter. BFP partners in South Korea notified us about them and we immediately began working to secure their release, which was not easy. These gentle souls, being old and having been neglected, needed serious medical care before they could fly, and while we tried to find local homes, there was nobody to take them in South Korea. After 2 months of negotiations with the shelter, and veterinary care, the boys were ready to fly..... and fly they did! On September 30th, we proudly welcomed them to America! All three are in foster homes and so far Theodore has had x-rays, an EKG, and surgery to pull out his rotting teeth. 10 were extracted! Simon has just also had surgery and 21 teeth were removed as was a fatty tumor! A fourth beagle was rescued with this group, but he was too unhealthy to fly. BFP has sponsored his ongoing veterinary care in South Korea and our rescue partners there found him a wonderful home. BFP spares no expense for these lives, and we hope you wont either. Please donate what you can, and click here to enjoy their video to freedom. We are always working as hard as possible across the country for more rescue opportunities. Please encourage your friends to sign up for our e-newsletter here. The Rescues, the Legislation, and the Outreach Campaigns are CRITICAL but we cannot continue without your help. Please continue to support this literally LIFE-SAVING work with a contribution today.